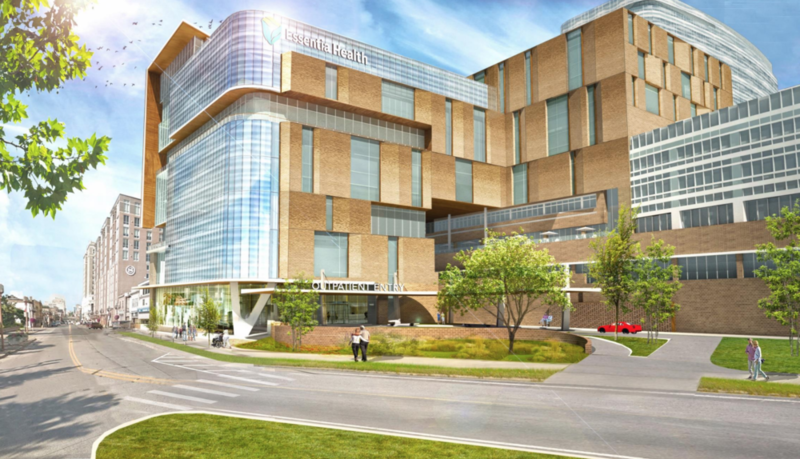 The massive $800 million, 930,000 square foot project will see the creation of state-of-the-art medical facilities that will allow Essentia Health to be able to provide the highest level of health care to the Northland. Plans for the “Vision Northland” project include $675 million for the creation of a new hospital tower, clinic and outpatient surgery center along with the renovation of 115,000 square feet of existing space. An additional $125 million will be used for infrastructure upgrades and financing costs. The decision to build up versus out was intentional. Essentia Health wants to reduce their overall footprint within the Central Hillside neighborhood in order to open space for other development to occur. This plan will will ultimately create a stronger neighborhood that not only serves Essentia Health and the surrounding medical district but the community of Duluth as well. Construction on the project is expected to begin this year with a completion set for 2022. Something that is unique in the planning process for this project is that you have a chance to voice your opinion. The means you also have the chance to affect the overall design for the massive project. Public comments will be accepted by the City of Duluth through March 13 and you’ve got a number of ways to submit yours. You can access an electronic copy of the environmental assessment worksheet prepared by Essentia Health by clicking here. There are also hard copies provided at the main branch of the Duluth Public Library downtown and also at the Mount Royal and West Duluth branches. Lastly, the Duluth Planning and Economic Development Office (411 W. First St., Room 110) also has hard copies available. On March 12th at 5pm, the Duluth Planning Commission will hold a public hearing within the Council Chambers at City Hall for comments on the environmental worksheet. If you can’t make it to that meeting you can also submit questions or share ideas on the project by visiting Essentia Health’s Vision Northland website here. With all this being said we have one last thing to say. Don’t waste this chance to make sure your voice is heard on the city of Duluth’s largest development project ever. What once was retail is now becoming space for healthcare. It was a tough year last year at the Miller Hill Mall when not only Younker’s closed but also Sears, both due to bankruptcies. Many malls across are losing one anchor tenant, but to lose two within months of each other is very uncommon. The two closures left almost 300,000 square feet of vacant retail space at the Miller Hill Mall resulting in a major leasing challenge. But good news, the vacant Younker’s space at the Miller Hill Mall officially has a buyer. Essentia Health has purchased the vacant space for $3.2 million. The building covers 145,000 square feet of space on two levels and has two different access points to the interior of the mall along with two different access points on the exterior leading to a large parking lot. While many were hoping for more retail to take over the space (rumors of Dillard’s even surfaced earlier in the year) the purchase by Essentia Heath and the change in use of the space is actually very common in the mall world these days. With large vacancies occurring at malls throughout the country property owners have needed to get creative in finding ways to fill them and trust us, they have. Spaces have become large fitness centers, universities, creative office space, housing and more. In the Twin Cities multiple malls are dealing with the closing of anchor tenants just like the Miller Hill Mall. 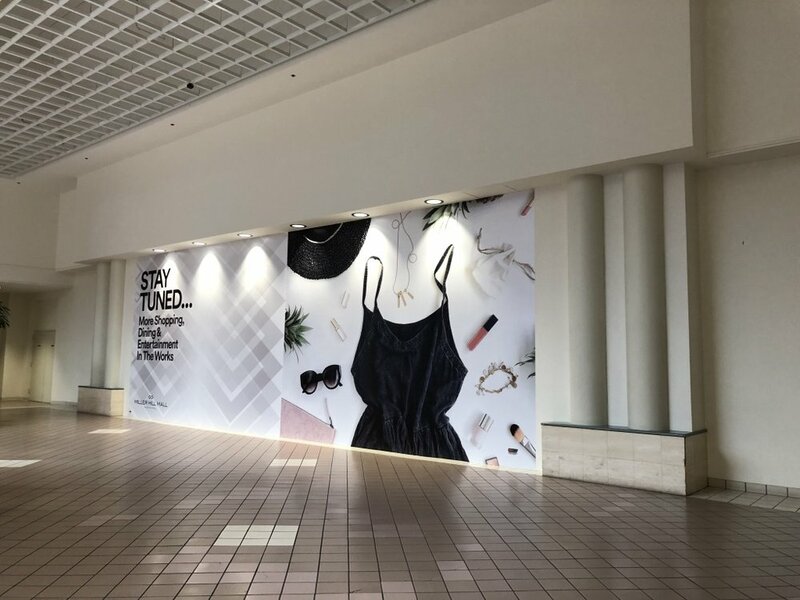 Southdale Center in Edina lost anchor tenant JCPenney and in response sold the vacant space to LifeTime Fitness who has since then torn down the building and is now constructing a massive fitness center, co-working space and retail space. Just North of Minneapolis Rosedale Center is dealing with the same problem of losing an anchor tenant when Herberger’s closed last year. Sources have stated that the JLL, the company that owns Rosedale Center, has plans to tear down the Herberger’s space and in its place build a large mixed-use development with housing, a hotel, retail/restaurant space and more. So, with all this being said Essentia Health moving into the former Younker’s space isn’t out of the norm, it actually IS the new norm. That’s a good question. Not many details on what Essentia Health plans to do with the space have been made public. Rumors are swirling that the Essentia Health Fitness and Therapy Center located at 402 E. Second St. will be relocating from Downtown Duluth to the Younker’s space. The reason for the move is due to Essentia Health’s $800+ million “Vision Northland” plan which will replace the center with a large new medical building/campus. The relocation makes sense overall but the question that we are pondering is whether or not Essentia Health will truly take up the entire space. To begin with, it’s a lot of space. Because it’s a lot of space it would make sense for Essentia Health to take over the upper floor and a portion of the lower level while designating some of the space that is directly next to the mall corridors for retail use. Whether or not Essentia Health would own that space and lease it themselves or potentially even sell it to the mall’s owner, Simon Properties, is a question that still remains. Here’s another thing that could happen. Essentia Health could demolish the existing building altogether. Sounds pretty crazy… but it’s actually not when you think about it. Essentia Health is currently investing millions in a new Health and Wellness Center just down the road in Hermantown. What that might mean is that not all of the services currently offered at the downtown fitness center would transfer (i.e. the swimming pools) to the Younker’s space as they may be offered at the Hermantown Wellness Center. And, if they do plan on offering the exact same services there is going to need to be some SIGNIFICANT construction occurring in the existing space in order transform it. There’s a potential chance that the overall cost for rehabbing the current space might actually be more than just building an entirely new building itself. At the moment we don’t have many details to share on the exact plans that Essentia Health has instore but when we do we’ll be sure to post more information about them right here. Duluth's retail core may become even more... retail... That is if one developer's plans are approved by the city. Launch Properties is proposing a new commercial development at the corner of W Central Entrance and Anderson Road. The development company is currently building a commercial development across the street that will include an Aspen Dental, a new Starbucks location, and additional retail space ideally situated for a restaurant. Plans for their next commercial development include 17,200 square feet of commercial space. That space will be broken down into three different buildings that will in the end include both retail and restaurants depending on how leasing pans out. Currently plans show a 6,800 square foot building that would house one retail space and two restaurant spaces. The next building include a freestanding 2,700 sqf restaurant building that would have a drive through (Raising Cane's, please). Lastly, there would be a 7,700 sqf building that would ideally be split between one retail space and two restaurant spaces. Entry to the retail development would be provided by a one way access from W Central Entrance heading towards Downtown. Both entry and exit lanes would also be available off of Anderson Road. 128 surface parking spaces would be provided within the commercial project. Launch Properties' proposed commercial development is heading through the City Planning Commission at their September 11th meeting. If you'd like to provide input on the project before then a meeting with the developers will occur today at 5:30pm at the Duluth Heights Community Recreation Center (33 West Mulberry Street). No tenants or renderings for the project have been released yet. The expected timeline for construction is Spring 2019 through Summer 2020. As more information is provided we will be sure to post it here at The Development Tracker | Duluth. There has been a question circulating around town for the last few months. What is happening to the former BP gas station at 2 E Central Entrance? Two words. Caribou Coffee. Local developer Kleiman Realty is currently renovating the building in preparation for Caribou Coffee to set up shop. This will be Caribou's seventh Duluth location and it will be just one mile from the Stone Ridge Shopping Center location and less than two miles from the Miller Hill Mall location. We've reached out to Caribou Coffee to see if this by chance might be a relocation but chances are that it is most likely not. Why not? Competition is getting hot. Recent additions to the area such as Dunkin' Donuts and the ever so present chance that Tim Horton's might enter the market are really changing the market. To make things worse for Caribou Coffee, Starbuck's has recently been investing significantly in new locations within the area. Just a few years ago they opened a new location along Woodland Avenue, remodeled their Downtown location and later this year will open a new location along Central Entrance (no word either on if that will be a relocation of the current location along Central Entrance or not). Recent news we've heard is that three other locations might be introduced within the Twin Ports within the next two years. Currently the details on the new Caribou Coffee location are scarce. Multiple permits have been pulled out for the renovation and work has been happening for the last few weeks. A Fall opening is expected. Whether or not this location will be a dual branded store like ones that have previously opened in Duluth is unclear. Caribou Coffee recently made some revisions to their expansion of the Coffee & Bagels chain where they partner with other chains such as Bruegger's or Einstein Bagels (among others). The partnership is still happening but going forward there is much more of an emphasis on the Caribou Coffee part of the partnership. We will keep you all updated with any additional details that we become aware of. Until then, dream of those Northern Lite Coolers that might just be a step closer to you depending on where you live. TACO BELL PLANS GRAND AVENUE LOCATION... AGAIN. Sometimes plans fall through and we are truly sorry for that. Good news though, plans have been revived for a Taco Bell on Grand Avenue but this time around it's planned for a new site at 4426 Grand Avenue. While the address states that it is on Grand Avenue the site is actually tucked behind a Subway location and will be accessible off of N 44th Avenue W. Currently the site is a gravel parking lot. The Grand Avenue location will be a 2,723 square foot building that will have a drive-thru and a parking lot with space for 23 vehicles. Believe it or not, it may actually be a good thing that the first location wasn't constructed when it was originally proposed in 2015. Why? Taco Bell has come out with a whole new design for their stores since then that has re-energized the brand and created a great space to dine and hangout in. Taco Bell has a great article on their website about the four new store designs that they introduced for their restaurants. The designs are mean't to play off the neighborhood and vibe of the city. What this allows for is a unique experience for customers that will differ from each Taco Bell they visit. 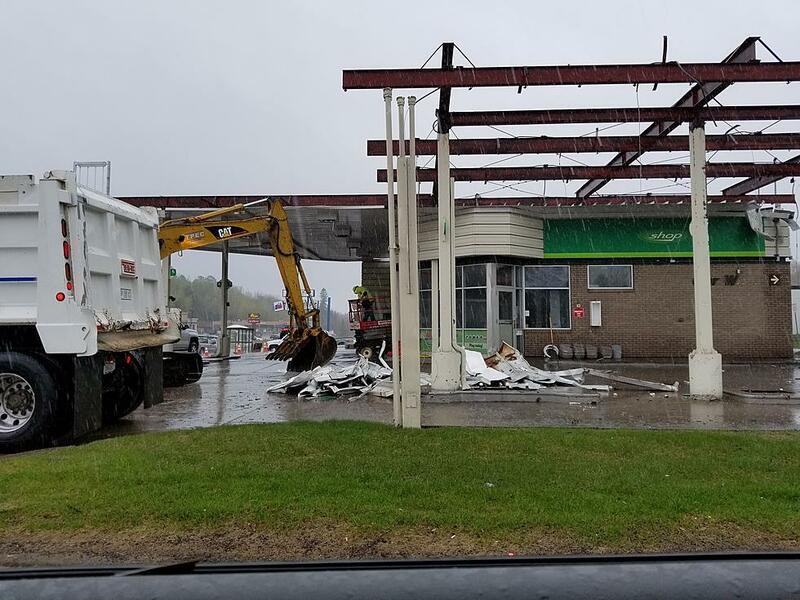 Taco Bell currently has one Duluth location on Central Entrance while another location is also currently being constructed on London Road in Duluth at the corner of London Road and 21st Avenue E. A location also recently opened in Cloquet. Both of the new Duluth locations are being developed by Marvin Development IV, LLC. SEARS AND K-MART ARE CLOSING. IS THERE A SILVER LINING? A closing is never good news, let alone two announced in a single day. That's what happened yesterday when Sears Holdings announced that not only would the Sears location at the Miller Hill Mall be closing, but also the K-Mart in West Duluth on Central Avenue. The two closings will result in a loss of a number of jobs in the city and will also introduce nearly 200,000 square feet of available retail space into the Twin Ports market. Sounds terrible, right? Here's why you might want to begin looking at these closings a little more lightly. There's a silver lining, even if it doesn't seem that way at the moment. Sears originally opened their Miller Hill Mall location in 1986. The store is a single level space that covers around 110,000 square feet and has entrances from both the mall and parking lot. That's quite a bit of space when you consider the mall itself is only about 830,000 square feet in size. An interesting fact about the Sears space is that Sears Holdings actually OWNS the store and the land underneath, meaning they control the exterior, interior, and the surrounding parking area. Today the site is estimated to be worth around $3.6 million. Now, let's talk about why Sears owning the land is a good thing. It means they have to sell. Selling could mean to another retailer, which is probably unlikely as most retailers these days are not tending to make investments in real estate, or it could mean selling the space to Simon Property Group, the owner of the Miller Hill Mall. $3.6 million is a small investment for a company like Simon. In addition, buying the former Sears space would allow the mall to take over more retail space and expand the mall which is currently near full occupancy (minus a few small retail spaces). So, what would Simon do with the space if they did happen to buy it? What would most likely happen is that Simon would redevelop the space into more retail space, similar to what they did about a decade ago when they redeveloped the former Walgreen's space at the front of the mall into a number of different retail spaces. This would result in an updated exterior, new parking lot, and a number of new retail spaces (H&M there'd be room for you too). Another option is that the mall could try to reposition the space as something entertainment related, a huge trend with redeveloping malls lately. That could mean a entertainment center of some sort, like Dave and Busters, or a movie/dining experience such as Alamo Drafthouse. Lastly, the mall could try to subdivide the space or lease the space out to another large retailer. Believe it or not there are still some big box retailers that are still expanding and waiting for space like this. In addition, if the mall is touching the Sears end maybe this will be the time for a full mall renovation. Simon is known for completing full renovations of malls while repositioning vacant anchor spaces. The closing of Kmart is without a doubt a major hit to the West Duluth neighborhood. It introduces a major void to the surrounding community which will lack a general merchandise retailer (i.e. clothes, food, household products, in one place) that is easily accessible. Another problem is that it introduces around 80,000-90,000 sqf of new retail space to the area. But wait, is that a problem? It might not be as the space being introduced is perfect in size to house a single or multiple retailers and is in a great area. Some retailers that could set up shop in the space that come to our mind are Aldi, which has been actively scouting for another location in Duluth, or something along the lines of a small format Target. Target has been opening a number of small format locations across the country recently with a number of them being in former Kmart locations that have recently been vacated. While the closure will certainly cause disruption to the neighborhood, a silver lining is surely in store (literally). Now we're just playing a waiting game. DTA, can we get some more transit options to over the hill for the time being? 2100 London Road has a name... and retailers. Duluth, meet Endi. It's the name for Harbor Bay's 2100 London Road (now 2120 London Road officially) project being developed at the intersection of London Road and 21st Avenue East. It's a unique name... so how did the project get it? Well, it's quite simple actually. The project is named after East Duluth. A long time ago when Duluth was growing, East Duluth was actually a number of communities including Endion (coming from the Chippewa Indian language meaning "my", "yours" or "his home"). The neighborhood was also home to the Endion Passenger Depot. So, chop of the last two letters and you arrive at modern version of the name, Endi. The logo itself features a faded image of Lake Superior along with the coordinates where Endi is located. Caribou Coffee and Papa Murphy's. Caribou Coffee will open a location on the ground floor of the project at the intersection of 21st Avenue East and London Road. This new retail location will be Duluth's fourth Caribou Coffee and will be the first to feature a drive through. It's been clear for almost two years now that Caribou was interested in locating at the site. When plans emerged that a new development was to occur on the former Burger King site Caribou Coffee's name came up pretty quickly. 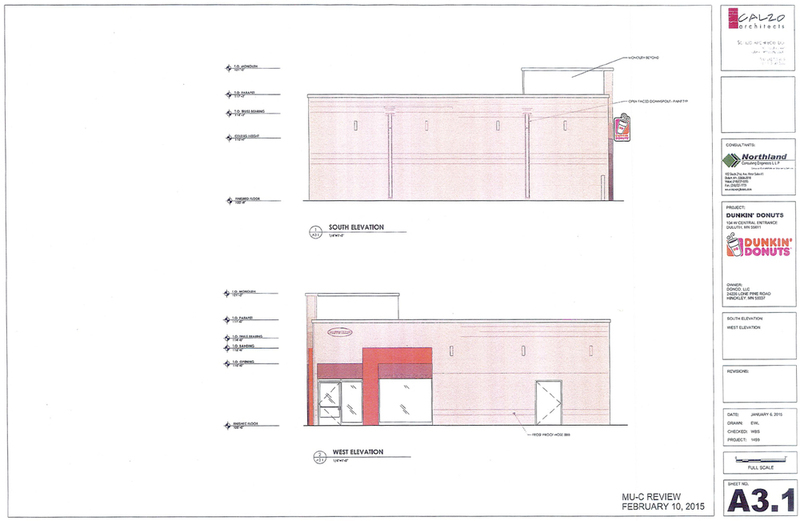 At one point in time plans were submitted to the city of Duluth showing a new freestanding Burger King to developed on the property along with a freestanding Caribou Coffee. Not long after those plans emerged a new set of plans took the spotlight showcasing a mixed-use development by Harbor Bay Real Estate Advisors. We always had our speculations that Caribou Coffee would continue to be part of the retail mix on site no matter what form the project took. The second retailer to locate in the project will be Papa Murphy's. The fact that Papa Murphy's will open another Duluth location shows their belief in the market. For years the company had a single location in West Duluth which was then followed by a location at the Kenwood Shopping Center near Super One. Both are still open today and this past fall a third, and much needed, location opened in the Stone Ridge Shopping Center next to... Caribou Coffee. While the exact locations where these retailers will be located within Endi has yet to be announced (Caribou is a given as there is only one retail space with a drive thru) we can begin to guess on how much space they will take up. 1,625 square feet is the size of a standard Caribou Coffee however the location proposed on this site previously was set to be 2,558 square feet. Papa Murphy's locations average between 1,200 and 1,400 square feet. Add the extremes of those two numbers together and you arrive at 3,958 square feet of the original 12,900 square feet of retail space being filled. That leaves about 8,942 square feet (not be exact or anything) of space remaining. That's actually a good amount of space that could house a few other retailers or another retailer and a sit down restaurant. It's known that Panera Bread, Chipotle, and Noodles & Company are actively scouting for new sites in Duluth for additional locations and all would be a perfect fit for Endi (all three could realistically fit). We're not placing any bets... but we're placing a bet... that there is a good chance that one of these restaurants might call Endi home in the future. GREAT, NOW HOW DO I LEASE A UNIT? We wish we had more details for you... and trust us, we're working on it. At the moment we have yet to hear how much exact units will be renting for within the building but what we can say is that is that the studio, one bedroom, and two bedroom units will be priced between $1,000 and $3,000 per month. Leasing has yet to officially begin for the project but will in a few months. Move-in will occur in late fall 2016 allowing residents to settle in before Christmas. Those lucky residents will be able to enjoy "extraordinary finishes, fabulous amentities, and breathtaking surises over the lake" according to the Endi's website. Some of those amenities include a private outdoor deck with seating, fire pits, grilling stations, and yoga platform. You can visit Endi's website here and sign up to be notified when leasing begins. Leasing for the project will be handled by Pinnacle Living who will also manage the property. Pinnacle began in 1980 and to date is the largest operator of multifamily housing in the United States with 135,000 units and over 3,000 employees spread across the country. As always, check back to CDINDULUTH for more exciting details about this project and others within the Twin Ports! Duluth knows how to do craft beer that’s for sure. This summer the scene will get even better when a Duluth favorite opens a new brewery and taproom in Downtown Duluth. Duluth's newly designated HART District (Historic Arts and Theatre) on East Superior Street will soon be home to Blacklist Artisan Ales. The company announced that they will move their brewery from their current location at 211 East 2nd Street to 122 East Superior Street. The space previously was home to the Last Place on Earth and is now undergoing an extensive renovation after being purchased by Duluth-based Titanium Partners LLC last year. Blacklist will occupy 5,700 square feet within the building and will act as the building’s flagship tenant. Plans for their space include not only a brewery but also a taproom for the public to enjoy their delicious brews. Currently Blacklist operates as a “gypsy” brewery meaning all their brewing and production occurs in rented spaces. Started in 2012, Blacklist is owned and operated by Brian Schazenbach, T.J. Estabrook, and Jon Loss. The brewery prides itself on developing and brewing artisan ales. All three are quite talented individuals. Brian holds a World Brewers Certification from the Siebel Institute and most recently worked for the Fitger’s Brewhouse in Duluth while Jon is a cicerone… which means he is literally a certified professional on serving beer and pairing it with foods. T.J. on the other hand has an extensive background in taxation law and is listed as the company’s General Consul and Brewfit Visionary. Sounds to us like a team built for success. Now let’s get this straight. Blacklist is quite the brewery when it comes to the beers they brew. It’s all in the ingredients which include grapefruit, green tea, lemongrass, and local honey among others. The move will allow not only for the expansion of production but it will also allow for the company to continue their experimentation with new ales. If you want to see what they currently offer, visit their website here. If you don’t care… still visit it because it’s absolutely gorgeous. In the past decade the area surrounding where Blacklist will open their new brewery has seen the addition of many new businesses and developments. Spearheaded in the early 2000's by Sherman Development's 11 story mixed use project including a Sheraton Hotel and condominium development, the area has continued to attract new businesses and development over the years. Notable new restaurants to the area within the last five years include Zeitgiest Arts Cafe and Tycoons Alehouse along with the recently opened Lark Cafe. The Zeitgiest Arts building also house Zinema 2, a two theater independent movie theater, and also the Teatro Zuccone, a 120 seat performing arts space that is home the wildly successful Renegade Comedy Club. The company produces six shows a year and twice a week they host their IMPROV shows which are always a hit. More recently Fond-Du-Luth Casino completed an extensive renovation to the interior and exterior of their space. Down the block the former Carlson Bookstore, now called The Lang Motors building, also is undergoing an extensive interior and exterior renovation. What could be argued as the most influential and at one point, crucial, projects within the district is the renovation of the historic Norshor Theatre. Owned by Sherman Associates, the renovation and restoration of the theatre has been planned for years. After some setbacks and issues with funding work on the project is expected to begin this year with a completion planned for late 2017. When completed it will introduce a 700 state-of-the-art theatre to the neighborhood that will operated by the Duluth Playhouse. The corner of Mall Drive and Loberg Road is under quite the transformation and it's only about to become greater. On one side Mills Fleet Farm is currently building a 200,000+ square foot retail store while near the opposite corner Holiday Inn Express and Suites is constructing a new 5 story hotel. The whole area has been pegged as "Hermantown Marketplace" by the city of Hermantown and in previous year saw the addition of HOM Furniture, DQ Grill and Chill, Subway and Volkswagon. It is expected to see the majority over Hermantown's commercial development over the next decade. St. Luke's also wants to become part of this growing area. Miller Creek Medical Clinic will move from their current location at 4884 Miller Trunk Highway near Lakes 10 theater in Hermantown to the corner of Loberg Road and Mall Drive. A new clinic will be constructed next to the Holiday Inn Express and Suites on what was the formerly the Eggebrecht Chevrolet car dealership. We spoke with Sandy Barkley, St. Luke's Vice President of Clinic Operations, about the new Miller Creek Medical Clinic and what is in store for the project. The new clinic is expected to open by year's end. While images are currently not available as it is still being designed by Duluth's DSGW Architects, the over all look and feel will be very similar to St. Luke's Lester River Medical Clinic. That clinic totals 9,700 square feet of space (less than half of what is planned for the new Hermantown Clinic) and was also designed by DSGW. Plans for the Hermantown clinic include a single story building that is about 20,000 square feet larger than the current Miller Creek Medical Clinic. The additional space will allow from the expansion of services currently present such as physical therapy and ophthalmology. Ease of access was a large factor. The clinics current location requires patients to make a u-turn at the Stebner Road and Miller Trunk Highway intersection. While patients could easily see the clinic from the road the question often was how to get to it. Another large factor prompting the move was simply space. As the Twin Ports has grown, especially Hermantown, the current clinic has too grown, or rather, outgrown their current space. It was the perfect time to move as the current lease of St. Luke's space is up in September 2016. St. Luke's expects to present the project for building permits sometime in March or April with construction beginning soon after depending on the weather. The project is expected to be completed by early fall. Twin Ports residents, your wish has been granted. That wellness center (think community center) that you've been dreaming about for decades now might not be that far down the road... literally. Essentia Health along with the city of Hermantown announced recently that a new $17 million wellness center will be built on the corner of Arrowhead Road and Ugsted Road in Hermantown. Construction of the new facility will take place on the site of the former Hermantown MIddle School. The land and building where generously donated by the Hermantown school board. A portion of the building will be reused while an addition will also be added allowing the structure to cover 72,000 square feet in area (almost three times the size of your local Michael's Arts and Crafts store). Essentia Health will gain the name rights for the entire facility after a generous $2 million donation was made allowing the initial conception of the project to move forward. As more fundraising takes place for the project naming rights within the building including community spaces, such as the gym, will be awarded. Plans for the building include quite a bit. The focal point of the project will be the aquatics center, a space that will include a swimming pool along with, hold your chairs kids, a play area COMPLETE with water slide. The rest of the building will include space for the local YMCA along with Essentia Health and of course communal spaces. Within those spaces a gym, fitness center with locker rooms, clinic spaces, daycare, classrooms, and other community space will be included. It will truly be a space for the community to take pride and gather in. Funding for $17 million project will come from a few different resources. $2 million as previously mentioned will come from Essentia Health. Another $2.5 million will come from the YMCA while $8 million is expected to come from the state (if approved in the 2016 legislative session). The remaining $4.5 million will come from the city of Hermantown along with St. Louis county. Essentia Health's donation will not only give it overall naming rights but also 9,000 square feet of space within the building to house a clinic featuring wellness programs along with space for sports and physical therapy. If all goes according to plan and the project receives state aid, construction would begin in 2017 with an opening scheduled for Spring 2018. The project would employ 15 full time employees and nearly 200 part-time employees. As always, check back to CDINDULUTH for the latest in Twin Ports development news! The saying goes "Good things come to those who wait". Here at CDINDULUTH we like to say "Bigger things come to those who wait" and the recent proposal for a new development on a busy Kenwood neighborhood shows that there might be some truth to our saying. United Properties showed the city of Duluth today their official plans for a development called Kenwood Village that would be built on the bustling corner of Kenwood Avenue and Arrowhead Road. Standing four stories tall (five with parking), the building includes 85 apartment units along with 14,000 square feet of first floor retail. The development would without a doubt dramatically change the vacant corner. United Properties had previously proposed a 14,000 square foot retail center for the site. We wrote about back in December about a 14,000 square foot retail development that United Properties was proposing for the site. At that time rumors were swirling of a Caribou Coffee and Bruegger's Bagels opening up within the development however no tenants were officially announced. Almost as soon as the development was introduced it was noted that United Properties was exploring the option of including housing on the site too that would result in a drastic redesign of what was planned. Well, now we know that plan is set in concrete... or about to be at least. The Duluth News Tribune had a nice breakdown of how exactly the project will be broken up. United Properties is looking to include about 34 one bedroom units, 21 two bedroom units, 12 three bedroom units, and the rest would be studio units (give or take a few). The first floor of the building still will feature about 14,000 square feet of retail space which could be divided in a multitude of ways (one could still feature that Caribou Coffee and Bruegger's Bagels as originally mentioned). Developers are looking at leasing to a casual restaurant of some sort (could we see Duluth's second Chipotle or Noodles & Company) along with other retailers that would be service oriented such as a bank or wireless carrier like AT&T. How much is United Properties about to sink into this corner if all goes as planned and rezoning variances are granted? We looking at a number around $20 million however nothing has been set in stone and the development could run even more. Exact rents for the building have yet to be determined and won't be for a while. However Vice President Keith Ulstad is quoted saying that rents could range between $1.40 to $2 as mentioned by the DNT. That means a 500 square foot studio would be around $700 a month, with a one bedroom coming in around $1,200-$1,400 and the two bedrooms around $2,000. Pricing would be similar to comparable units found within the Twin Cities metropolitan area. As with any development, more people means more traffic. It's inevitable. But hey, you live in a growing city and unfortunately in a society dependent on vehicular transportation traffic is unavoidable with growth. Access for the project would be off Arrowhead Road and Cleveland Street which would help lighten the headache on Kenwood Avenue. Developers are even willing to give up a 10 foot wide strip of land in order for a dedicated left turn land to be able to be built. United Properties would also be willing to pay for traffic light upgrades. Developers will need to rezone a portion of the property in order for construction to be able to begin. If that goes according to plan we could see shovels hit the ground in late summer and see residents moving in by late summer 2016. More residential units (and when we say more we mean A LOT more) are planned for the BlueStone Commons development on Woodland Avenue in Duluth. In fact, 142 units are under construction as we type and you read. The Duluth News Tribune revealed more information today about developer Mark Lambert's plans for the continuously growing BlueStone Commons development that began a little over two years ago with the construction of BlueStone Lofts. BlueStone Flats will be the name for the second residential building that will be located to the northeast of the current residential building. At 4 stories tall the new building is slightly shorter but will include 42 more units that the first building for a grand total of 142 units in an F shaped building plan. Designed by Minneapolis based ESG Architects the new building features modern design elements that compliment the first housing phase of the development. New amenities for the second phase will include an indoor swimming pool, club room and a fitness center. Other special amenities will include a sauna and massage room along with, drum roll please, a pet bathing area. Yes folks, you will be able to officially bring your beloved cat child and canine friend to BlueStone. All amenities will be available for any BlueStone resident. Units within BlueStone Flats will be smaller than those at BlueStone Lofts with most units sized for one to two residents. While the units will feature largely the same finishes as the first phase, including custom cabinetry and granite countertops, one major difference between the first and second phase is that the lofts will include units with balconies. Demand has been so high for units at BlueStone Commons that developers are already planning a third residential phase even as the shovels just sink into the freshly thawed ground for the second phase. That third phase will be called BlueStone Vue and will include roughly 100 more units planned occupancy in 2017. Construction on BlueStone Flats is projected to be finished by May 2016 with an early summer occupancy. A project for the corner of Kenwood Avenue and Arrowhead Road is moving forward as United Properties begins to solidify their plans for what will now be a mixed use center. Finance and Commerce reported on latest news regarding the development late last week. CDINDULUTH reported on the first wave of news for this particular site a few months back when plans were floated for what at that time included a retail center that would be home to the areas first Caribou Coffee and Bruegger's Bagels location. However even with plans in place it was hinted that those plans could change in both size and offering depending on the demand in the market by time of construction. United Properties looks to have taken the alternative path to their original development plan and sources are saying that the development will include retail and upscale housing above (most likely apartments). The Duluth News Tribune noted that the developers recently paid a hefty $1 million to purchase the corner of Kenwood Avenue and Arrowhead Road along with a neighboring home. The site originally was to be home to a Duluth Teacher's Credit Union branch back in the early 2000's however plans for that branch never moved forward even after rezoning of the site was approved. DTCU did eventually open a branch across the street in the Kenwood Shopping Center. After DTCU a number of companies went after the site with McDonald's even exploring the option for a restaurant on the site at one point. The most recent interested party was Walgreen's who ended up not being successful in their efforts to build a location on the site but did in fact end up building a new store across the street. What exactly is planned for the site will be released later this month when United Properties details their plans further at a press conference. As always, CDINDULUTH will keep you updated when news becomes available. The new 143 unit apartment project planned for a site on London Road and 21st Avenue East moved forward this week as the Duluth City Council voted to approve a $2.8 million subsidy for the project. The $36 million project is planned for a site that formerly housed a Burger King restaurant which originally was planned to be rebuilt with another retailer locating on site also. Harbor Bay Real Estate Advisors are the ones behind the project, the group is composed of of two former OPUS employees (we reported on the project a while back, you can read that post here) who have extensive background in developing similar projects. Dubbed "Harbor Bay Flats" work is projected to begin in June with a completion about a year away in 2016. The building will be five stories tall from the I-35 side of the project but will appear to be only two stories tall from the London Road side. That building will feature 13,000 square feet of retail space, spacewe still wouldn't be surprised if we saw a Caribou Coffee / Bruegger's location sprout up. We'll continue to cross our fingers. Visit the PROJECT PAGE for more information on this project including detailed floor plans, renderings, and more. West Fourth Street is about to get a brand new clinic building if all goes according to plan for Fond Du Lac Development. The project would be located right down the block from another new development, the recently completed Steve O'Neil Apartments, which wrapped up construction last month and has already shown a significant impact on the neighborhood. The Fond Du Lac Tribe has submitted plans to the city of Duluth for a new clinic building to be constructed at 464 Mesaba Avenue next to their current CAIR (Center for American Indian Resources) clinic and on the same block as Scared Heart Music Center. Designed by DSGW of Duluth the new 40,000 square foot clinic would stand three stories tall and feature indoor parking on the first level for 24 vehicles including two handicap spaces. The exterior of structure would feature a large amount of red brick along with metal accents and a large number of windows. With increased demand in recent years for medical care a logical need for more space has also arisen. The creation of a new building will allow for the expansion of medical care, pharmacy, radiology, and lab space. The new structure will also allow new services to be introduced such as occupational and physical therapy, adult and adolescent chemical dependency treatment, and behavioral health counseling. Fond Du Lac chose this specific site for this project due to fact that no other suitable sites were available in desired locations and areas. The proposed site was the most logical as the original CAIR clinic sits directly next door the new space and will therefore allow for a seamless transition for new patients and those who have been coming to the clinic for years. In addition it will also continue to bring new jobs and growth for the neighborhood. There are a few challenges associated with the project that have required that multiple documents be submitted to the city planning commission. Due to the lack of adequate parking space on site along with the challenges of constructing new parking lots on a sloping grade and on a site of bedrock, the developers are looking to establish parking on two neighboring sites. One is located at the corner of West 4th Street and Third Avenue West and the second on the corner of West 4th Street and Third Avenue West. These two lots would provide additional parking for the clinic as the spaces on the first floor of the being would be reserved for patients and emergency drop offs. Staff would also have the ability to park in the alleyway behind the new structure. Results from last nights Planning Commission meeting will be available within the next few days. If all goes according to plan construction could begin as soon as this summer. Feel free to post any comments below regarding your thoughts on this project. Dunkin' Donuts will go before the Duluth Planning Commission tonight in hopes that all is approved for a new location at 104 West Central Entrance. We're excited to show you just what Minnesota's second and northern Minnesota's first Dunkin' Donuts restaurant will look like. Designed by Scalzo Architects of Duluth, Dunkin' Donuts will sport a modern design that showcases the brands fun and iconic color scheme. A complete renovation of the interior and exterior of the former Warehouse Liquor building will allow for a completely new take on the structure and its design. What was once a liquor store will be home to the delicious smells of freshly roasted coffee and of course those delicious donuts. The 2,450 square foot space features dining space to the front with kitchen and prep area tucked to the back. The interior shows seating for around 26 people at both tables and booths. This location will also feature a drive thru which is sure to be a hit when the coldest of northern Minnesota's winter days hit. All should go well for Dunkin' Donuts when they present to the Duluth Planning Commission tonight. The only catch would be that the parking plan shows 23 spaces which may require a revision as the site is technically allowed only 22 spaces. But in the grand scheme of things that's a very minor hiccup and nothing to be concerned about. Construction could begin as soon as April and delicious Dunkin' Donuts coffee and donuts could be in your hands by the end of Summer.